"Century 26: History Lesson (Part 1)"
Superman informs the rest of the New Gods that not only is he going first but that he is not going to invite any debate about the matter. Lar-El, the son of Superman and Beautiful Dreamer, protests his father's decision reminding him that Metron has repeatedly said how dangerous it is. Superman informs him that there will be no arguments. He has been away from Earth for five hundred years and that if this is the only way to get back Highfather tells him that he must take it. Highfather also gives the Man of Steel a Mother Box since she may prove of use if Beautiful Dreamer's visions come true. Dreamer asks him one final time if he is sure that he must do this. She also asks if he is considering the needs of the people of New Genesis and his family. Superman tells her that he has to do this and that it reflects in no way his feelings for her and the children. Metron informs the group that the time to talk is behind them. The gateway he has opened is temporary and it will take centuries to open another that will be sufficient enough for all of New Genesis to pass through. Before passing through the portal Metron has one last request. He hands Superman a small device and asks that Superman give it back to him the next time they meet. Superman is confused, but Metron tells him that all will be made obvious in time. With that Superman flies through the portal and finds himself back near the Earth. As he flies towards his adopted home he wonders why the planet hasn't changed all that much over the past millennium. Before he can contemplate the matter further Superman spots a battle in the distance with his telescopic vision. He lands in Smallville and before he can do anything the unconscious form of Lara Wayne smashes into him. He examines her and for a moment thinks that she is Lois Lane. Suddenly Batman appears and lands a powerful blow across Superman's jaw. Superman is dazed, wondering how long Batman could hit so hard. Batman replies that it has been about seventy-five years and after landing a powerful kick to the Man of Steel's head tells him that he should have been briefed better by whoever sent him. The two trade blows until Superman finally convinces Batman by telling him that he knows that Bruce's parents willingly went to their deaths because they knew it would help create the Batman. Batman is stunned but convinced while Lara is simply amazed that she is finally meeting her great-grandfather. Superman, though, realizes that if he has a great-granddaughter and Batman has super powers than he has more to catch up on than he thought. Batman and Lara explain how Parademons have attacked Earth once every one hundred years live clockwork and each time their forces grow stronger. Batman reveals that the real mystery is if the Parademons had these resources than why they didn't unleash their full force when Batman and company were so much weaker. Superman thinks he may have the answer, but first he wants to be caught up on what has happened since his disappearance, specifically why wasn't the technology of Earth more advanced. Batman begins by telling him that they have had to start over a couple of times. He tells Superman of Luthor's escape from prison in 2025 and how the villain hooked up with a few Parademons and unleashed a blackout bomb that wrecked Earth's technology. Every power source of the planet knocked out within a thousand miles of the Earth, which caused the collapse of civilization and the death of Green Lantern Hal Jordan. Batman and a few thousand more people were able to get underground, but billions were left on the surface to fend for themselves. Those that didn't die of disease and starvation grew stronger for their survival. Eventually Batman and his people discovered that the bomb has altered the electromagnetic field of the Earth forcing them to develop a whole new kind of technology. As Batman and his people were ready to go topside to restart civilization the Parademons attacked. With the help of Lois, Lara and Clark Wayne they were able to fight them off and it was around that time that they figured out that the Parademons were coming every one hundred years. Lara continues by revealing that once they knew they were on a clock that civilization had to be rebuilt. One way they thought of to fight off the Parademons was using the descendants of Buddy Blank, also known as OMAC, the One Man Army Corps, to create an army of Omacs. When they failed to get the proper DNA they searched and found the body of the man who one of the descendants called Kamandi knew as his grandfather. The old man had been dead for some time but they were able to find enough viable tissues to make their clones. With their army in place they though they were ready for the next attack, but one of the few super powered individuals left fell in battle. Wonder Woman, daughter of the original, was taken out, which brought her mother out of retirement. Diana stayed with them for more than a century and even had a romance with Batman. This brings a wry smile from the Man of Steel leading Batman to ask if it was really all that surprising. Eventually Diana left to be with her people causing Batman to fall into a slump until the day Lara came and asked the location of the hidden Gold Kryptonite that the Ultra-Humanite had used to strip Superman of his powers. Lara had fallen in love with a Green Lantern known as Ator and their apparent age difference had caused problems between the two. Superman is confused until Batman explains that the Blackout Bomb had messed up their aging process. Lara had hoped that losing her powers would cause her to age, which it did but Ator was killed by Luthor, who then declared all out war on humanity. The battles between humanity and Luthor raged on. Every time Batman and his forces thought they had him beat Luthor would reinvent himself. Then the war took a dark turn when Luthor blanketed the Earth with Green Kryptonite radiation. 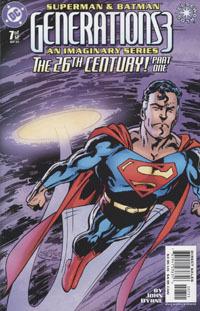 Lois and Clark died while Lara lived since she was immune after her exposure to the Gold K. At that moment Lara looked at the world and her responsibility to it and with Batman's guidance decided to use the Gold K antidote that the Ultra Humanite had created for when he would claim Superman's body. Lara had a condition to this, which was that Batman gain super powers through the method Superman had devised to give human Kryptonian powers. The process had failed in the past, but with Batman being an immortal it worked. Superman asks why they needed powers with the Omacs around. Lara realizes that they forgot to tell him about the fact that each Omac was linked to the other and when one died they all felt it. In the end there was one Omac and even he died fighting Luthor. With both of them super Batman and Lara went after Luthor in force. He tried to kill them with Kryptonite, but the process that gave them their powers had made them immune. Finally they beat Luthor once and for all. After that they set about rebuilding humanity knowing that soon the Parademons would be back, which brought them to the present. They were able to defeat the Parademons, but Lara admits to their premonition that the next time they came their forces would be more powerful. Superman tells her that they will and that's the whole plan. Batman asks what Superman knows that they don't while Lara wants to know where he has been for five hundred years. Superman explains that he can answer both questions at the same time. The trio flies to Superman's boyhood home, which is really just a sophisticated hologram since the original wood frame took quite a beating when it was derelict for a hundred years. Superman isn't concerned with that or the fact that his old lab was the same as long as what was under it lay undisturbed. He rips through the floor to reveal the decayed body of Saturn Girl. Batman and Lara wonder what the body of a girl born in the future was doing under the Kent's home. Superman replies that it all has to do with the Parademon attack him and Bruce dealt with in 1925, which they thought was the beginning, but really it was the end. Superman decides the best way to handle the situation is to visit the future and find out all the facts before they go charging in. With that he flies off telling them that time travel being what it is he will be back before they know he's gone. Elsewhere Kanto, Desaad and Granny Goodness discuss the mental state of their resurrected master Darkseid. Both Kanto and Granny are concerned with the logic of his scheme, but Desaad isn't worried. He knows their master is trying to manipulate the fabric of time and space so that past, present and future alike will be toys for him to juggle. Meanwhile, the teenaged Lois Lane and Lana Lang are trapped in the Time Bubble. Lana demands that Lois make it stop, but Lois tells her she can't. Lana is confused since Lois has been hitting buttons like she knows what she's doing. She asks Lois which button she pushed first. Lois replies that she didn't push any buttons before they began their journey and that she thinks the Bubble knows where it's going and that it won't stop until it gets there. Story - 4: I have to admit that as much as I enjoyed the return of Superman to the series this month's installment left me feeling rather uneasy. I have some problems with what Byrne did, but at the same time I understand why he did it using the method he did. I did enjoy the exposition in this issue and thought that it broke down the major events of the past six issues into a fluid narrative. For any one that may have come in late this was a good way to let them know what has been going on and for those of us who have been reading the series since the beginning it was a nice reminder. Byrne seems to be moving ahead with the initial plot unlike the last two issues, which, while they were good, kind of deviated from the main plot, though they also had some major events, like Lara losing her powers. Superman's reactions to these events were amusing in some cases and fitting overall. His response to finding out that Bruce and Diana had been an item was kind of funny, at least to me, since every other Elseworlds seems to have Superman and Wonder Woman hooking up. It also nicely reflects the current storylines in JLA, where a bit of an apparent romance has blossomed between royalty and the upper crust. It was nice to get back to Lois and Lana, the girls in the Bubble. It was one page, but it's nice to see that Byrne didn't forget them. Not that I really thought he did. I mean most writers have a pretty good roadmap of what they want to do, so while it appears to us that things are left out the really aren't. But you knew that already. Now on to the uneasy portion of this week's review. I had a serious problem with Byrne's decision to kill off Clark and Lois Wayne. I'm not trying to second guess his decision, but at the same time I really didn't like it mostly because this series had a very good ongoing cast and now two of them are gone. I also liked the characters even if nothing much had been done with Clark. To have the two killed off pretty much off camera seemed kind of sudden and maybe that's where my main problem is. After thinking about it for a little bit I realized that this might be part of the grand scheme of the story and sometimes the plot takes precedence over character. Also I have this sneaking suspicion that by the end of the story none of it may have happened, so I deal. Time travel stories like this tend to end with everything being back to the way it was before the story began. Then again it may not. Who knows? I also had a slight problem with Lar-El and Superman's family on New Genesis. Actually I had two problems with them the first being that Byrne felt the need create the characters at all. I mean it seems the cast is getting larger and larger with these characters we see for three panels and then they either disappear or die. The second problem is that I have a hard time accepting the fact that if Superman had a family that he would abandon them. Yes, Earth is his adoptive home, but after spending five hundred years with Beautiful Dreamer and having children with her you would think he would have more of an attachment. Of course the plot would be nothing if he stayed, but the nonchalance with which he left doesn't really seem like Superman to me. In the end I liked this issue, but felt that killing off two characters that I liked was unnecessary, but then again just because I like a character means that they should live or die. I'm willing to trust Byrne, though, and see what he has in store. Art - 4: The art in this month's issue was pretty solid overall, even a bit darker than some of the previous installments. The first page had an ominous feel to it with the shadowing on Superman's face underscoring the seriousness of what he was saying. The rest of the artwork was decent. The fight between Batman and Superman was handled well as were the flashback sequences. There was a lot of power in the simplest of panels. A good example of this has to be on page seventeen when Lara reveals that they took care of Luthor once and for all. From the shadowing and the back lighting you get the sense that the battle was fierce and though they won it didn't end well. Superman was drawn extremely well in this issue. Still a little leaner than how Byrne used to draw him, but there was a lot of personality in his facial expressions. The smile Superman had on page twelve upon discovering Batman and Wonder Woman's relationship was classic. Mainly he exuded power, like on page twenty when he flies off for his time travel. Superman was worth the price of admission. I REALLY liked the coloring on page twenty-one. The coloring around Darkseid was nice and had that Kirby feel that I think Byrne was going for. In contrast I liked page twenty-two just as much. Its absence of background helped emphasize Lois and Lana's plight. Overall the artwork was great. There were moments when it felt like it wasn't as good as previous issues, but between Superman and Darkseid I can't say a lot of bad things to say about the art in this issue. Cover Art - 4: On one hand this cover was eye-catching. Superman dominated the cover and his expression had a very Shuster look to it. On the other hand the background, while fitting to what is inside the comic had too much yellow and purple. The purple doesn't gel with Superman and is distracting. However, I do believe that if a Superman fan had yet to pick up the series this cover might make him or her want to.